The various charters that were in force in the colony of New York, the constitutions adopted by the people of the State of New York since the Revolution, and the federal constitution and its Bill of Rights, are reproduced here to give context to the decisions of the judges in the landmark New York cases highlighted on this website. Following the Revolution, New York commenced the process of adopting its constitutions. A constitution is the paramount law of the nation or state that constrains and provides the framework for the exercise of power. In the federal and New York State constitutions, governmental authority originates with the citizenry and is based upon the commitment to liberty under the Rule of Law that gradually emerged during colonial times. The government itself is not above the law and governmental power is divided; laws are enacted by one body, administered by another, and an independent judiciary ensures that the laws are constitutional and administered fairly and objectively. The rights of individuals are determined by legal rules rather than the arbitrary actions of the government, and no punishment can be imposed unless a court decides there has been a breach of law. The U.S. Constitution and its Bill of Rights also must be considered when looking at New York's adherence to the Rule of Law. In addition to presenting the documents themselves, we look at the New York contribution to the ratification of the federal constitution. Eight hundred years ago (June 19, 1215), England's most powerful feudal barons gathered at Runnymede, on the banks of the river Thames to force King John to formally recognize their traditional legal rights by signing a charter known as Magna Carta. Divided into 63 chapters, Magna Carta established the crucial principle that the "law of the land" existed independently of the monarchy, and that the king was subject to it. The charter also recognized the rights of the barons to trial by jury, due process and habeas corpus. Widely considered the foundation of the English and U.S. constitutional systems, Magna Carta is the source of modern constitutional concepts such as government bound by law (rule of law), impartial justice and representative government. 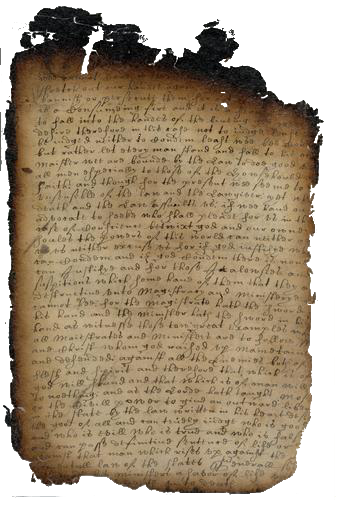 The New York colonial charters were the fundamental law under which the colonists were permitted certain rights by the sovereign. 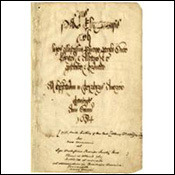 These documents were the Duke's Laws of 1665, the Charter of Liberties and Privileges of 1683 and the charter that was in force at the time of the Revolution, the Charter of Liberties and Privileges of 1691. 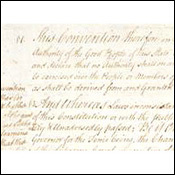 The first New York Constitution was adopted by the Convention of Representatives of the State of New-York on April 20, 1777. A second constitution was adopted in 1821, a third in 1846, a fourth in 1894 and a fifth in 1938. This site features two invaluable resources on New York's Constitutional history: Charles Z. Lincoln's The Constitutional History of New York and the NY State Consitutional Convention Reports of 1938 (known as the Poletti Reports). In 1787, the draft federal constitution was submitted to the states for ratification by popularly elected state conventions. In New York, the Anti-Federalists argued that the new and more powerful national government operating under a constitution that did not include a Bill of Rights would seriously endanger both the rights of individual citizens and the rights of the states. 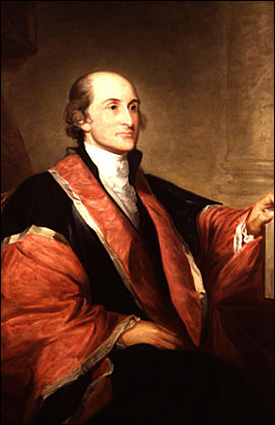 The Federalists believed that individual rights were fully protected by state and common law, but to ensure ratification, agreed that a series of amendments protecting individual rights would be introduced at the first Congress convened under the new Constitution. Of these twelve amendments, ten were ratified by the states and became the Bill of Rights. 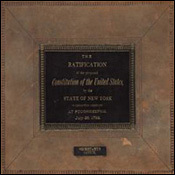 The draft constitution, the ratification statement on behalf of New York and the direction to the New York delegates (all courtesy of the New York State Library) are reproduced here. More information about New York's ratification of the federal constitution is available in our Legal History by Era Revolution & the Emerging State: Canals, Railroad & Steamboats, 1777-1846.